Anyone remember ESA? Nvidia's attempt at making the PC platform its own with the 'Enthusiast Systems Architecture' software? The idea was to get other manufacturers to include little chips in their hardware that enabled them to talk to Nvidia's motherboards. Nvidia's ESA software would then report all the readouts: voltages, temperatures, speeds and so in a single, central interface. The problem? Other companies (mostly motherboard makers) already had their own software, and they were (and still are) key features with which to differentiate and sell their products. They already did most of the same tasks, such as temperature and voltage monitoring, as well as overclocking, even if they lacked the fancy 3D interface. Despite its noble ideals, ESA was never really accepted and it died as quickly as it arrived. 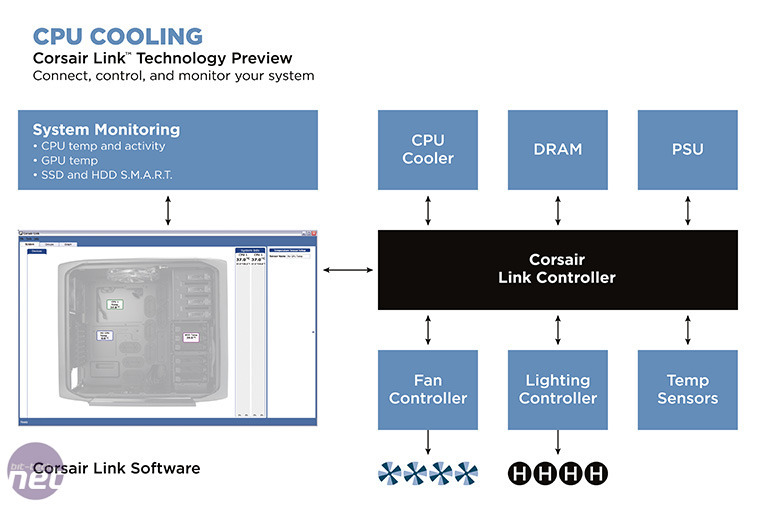 Roll on three years and Corsair is trying the same trick with its new Corsair Link software. The difference is that Corsair isn't trying to drum up support from other companies, as it already builds many different products. Instead, Corsair Link is the company's selling point for its own hardware range, which has considerably diversified in the last 12 months. In case you didn't realise quite the scope of Corsair's products, it now makes speakers, headphones, PSUs, PC cases, heatsinks (both air-cooling and closed-loop water-cooling), SSDs, flash drives and memory. In fact, you would only need a Corsair graphics card, sound card and motherboard in order to make an entirely Corsair PC. I bet its Pokemon set was unbeatable in school. 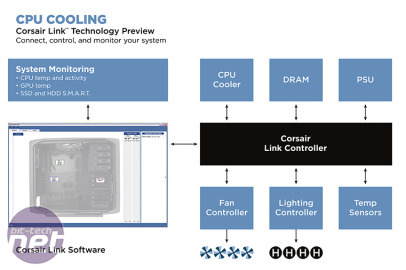 As you would expect, all those components can throw out a lot of useful stats for enthusiasts who like to know (okay, often obsess about) what's going on, so tying all that together under one software roof makes Corsair Link a potentially very powerful tool. It could well work too, because the technology isn't competing with that of other companies - cases, PSUs and memory don't come with monitoring software, although they can be read remotely by the motherboard through its own software. However, the ways in which Corsair Link differs from the software included with motherboards remains to be seen: does the company have (or plan to have) ESA-style monitoring chips in its cases, PSUs and memory? We'll have to wait and see. Corsair is busy making a platform for itself, and given its brand strength I can really see it working. But I'm worried; will this help kill competition by pushing the PC more towards being a closed platform? It's unfortunate that Nvidia's ESA wasn't taken up, as it potentially offered an open standard across the industry to give a greater level of monitoring and control for customers, no matter what hardware you bought. However, with every company wanting to stamp its own brand, design and influence on everything it makes, it was bound to fail. Corsair trying to entice you to buy other Corsair components via technological treats is a different matter, though.